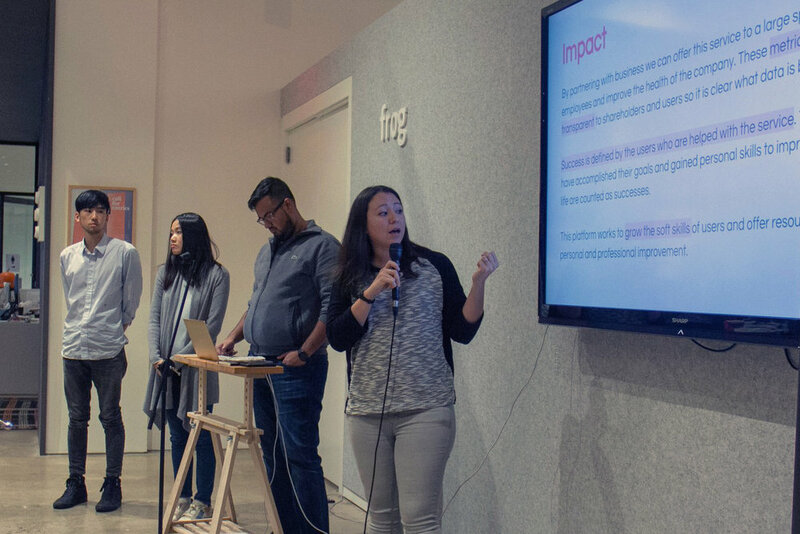 HexHacks18 was a hackathon hosted by Hexagon NY at Frog design studio. It was a design jam event focused on bringing our minds together to create solutions that can promote underrepresented communities in tech and uplift our community of women and non-binary individuals! I was part of a team I met that day for the 10hour hackathon. My role was Team Lead, where I was responsible for research, managing our project in such a tight time frame, and ultimately presenting it to the judges. Women in tech face different challenges from other industries due to the nature of a predominantly male-dominated culture. Navigating these challenges for the first or fifteenth time can be difficult without resources. Finding a mentor at a job or even a sounding board for work issues can be hard for some women. A mobile app that provides coaching to help women gain the tools and resources necessary to obtain equality in the workplace. The main component of the app would be a chat function where users could reach out with a problem they are struggling with and receive real-time feedback on how to tackle the issue. Based on the issue that brings you to the service we will match you to a business coach who can help you improve through a personally curated toolbox of solutions that go beyond a simple conversation. There are current chat counselor services that exist, but they are more for overall mental health. Talkspace one of the leaders in the industry with an easy to use application and reasonable prices. Their services are price tiered based on the amount of communication you need, chat only, voice chats, video chat. Their focus is on communication in any form. Our service would take this idea of communicating digitally with a coach or mentor and add follow up goals and additional resources. Talking about an issue is great, but if users know there is a level of accountability with the problems they need advice, they become more invested in the process. The service moves from just a place to vent an issue to a place to solve a problem. Accountability and Resources, that why we stand out. Linda, an overworked employee at a startup who wants to talk with her boss about no longer working extra hours on weekends. She isn’t sure who to talk to at work about her problem since she is new to the team and doesn’t want to upset the environment. She also is the only woman on her team and there aren’t other women in leadership roles at her company she can look to for leadership. She goes to the platform to find a coach to help her with this problem. Her coach listens to her issues and gives her some goals to improve her confidence. A week later the coach prompts Linda to see how things went with talking to her boss and if her situation has improved. She also recommends Linda completes the skill-building exercises. The users helped by the service defines success — the users who have accomplished their goals and gained personal skills to improve their work-life count as victories. This platform works to grow the soft skills of users and offer resources for personal and professional improvement. By giving women a safe space to discuss problems, they are facing at work with mentors who hold them accountable perhaps the next time they face a struggle they will have the tools and confidence to tackle that challenge. After the Hackathon I developed out our sketches into more High Fidelity screen. One of the screens we developed during the hackathon was the screen to start the discussion. We presented bubbles of current issues most women face as a way to start the conversation. We wanted it a simple welcoming screen. Taking the paper and pen ideas into Sketch, I used the Apple UI Kit for simple fonts and a clean look. There had been a discussion of abstract bubbles, but for a rough prototype test, I keep the conversation topics simple. The idea behind this version was to test the concept feel on your phone in your hand. With my low fidelity screen, I was able to test the concept of this screen with other users in the Hexagon Community. While they liked the general idea, feedback was that the topics were too "Big Idea" and some users may not be sure what category that addressed their problem. This version removes the bubbles and shows users examples of issues that others are discussing to encourage anyone's engagement. I can juggle and create balloon animals, got the backup clown career ready. I have a growing collection of stress-balls I gathered from all the trade show events I have attended.